They are not giving too much trouble for people who currently have the problem and need new parts. This is about getting the money back that was paid to have them replaced before they extended the warranty. I had mine done at the dealer a couple years ago Before I had a warranty. I called up and person who takes cares of claims sent all the paper work for me. Hopefully I hear something in a week or so. This thread needs to get stickied. 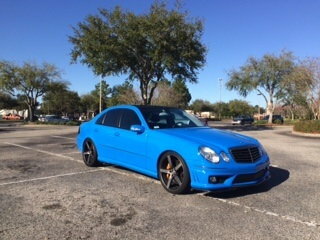 I contacted my local MB dealership about a week ago and the warranty guy there said he submit my request to corporate. He said he'll contact me when he hears back from them. Will keep this thread posted. Got a call from my Mercedes dealership after filing a claim for paying for this job a couple years ago on my E55. He said his accountant is writing up the check for reimbursement and he'll give me a call when it's ready. Nice move Mercedes! Just heard from my dealer today and they are covering the sender I replaced, but not the cost of the seals or the pump assembly. They say this is cause only the sender was purchased through a Mercedes dealership and they can not approve reimbursement on parts purchased from vendors other than a Mercedes dealer. I am on the phone with customer care right now trying to get this sorted out. Called my service advisor last week. He pulled up the RO , printed a copy and gave it to the girl that submits the info to MBUSA . He is going to call me this week to confirm that everything got submitted. What was the feed back for the Non-Dealer purchased parts? I made the repair to the pump myself back in Oct, it would be nice to get that $450 back. I still have the box, came direct from the MB warehouse yet purchased from non-MB vendor. Should be getting my check this week. Picked up my check today for full reimbursement on parts that I purchased and installed myself. What was customer care's response for the pump, and what did you need to tell the dealership to make it happen? Got my check from the dealership today . Only took two weeks from the time I submitted the claim . Ironically , the car is at the dealership having getting the fuel pump replaced again . Tomorrow will be exactly one year since the tank, pumps and sending units were done the first time . At least it's warranty now otherwise I'd be very pissed. Was it leaking again, or did you just take it in and say fix it?? Good to hear they paid the claim. I received my reimbursement check in today's mail. The service manager at MB Manhattan was great. No hassle whatsoever! Was it leaking again, or did you just take it in and say fix it?? Good to hear they paid the lclaim. The pump wasn't rumning but it actually turned out to be a faulty ground and not the pump . If you were to pull the seat bottom , remove the access plate and pour a little gas around the top of the sending unit then take it in saying you can smell gas inside of the car , they would probably do it. I don't think you would have any luck unless you state that you smell fuel. I got my reimbursement check yesterday. Tank was repaired in late 2012 but I kept the receipt. My check came just in time to offset the 82mm throttle body and a few other additional goodies . So those getting refunds, was the work done at an Indy or the dealer? Was a cc slip or cancelled check required? Did the receipts from the original work say "fuel smell"? Mine was done at the dealership. They were able to pull up the RO from their system without my receipt . Fortunately ,the service advisor did write mine as"fuel smell" as I hear they are being a pain in the *** if that isn't noted on the RO . Paid in five business days, can't complain about that one. I bought the parts(pump/seal/ring) from a local parts store and installed it myself. I was only going after parts cost, and got 100%. I included checking account statement for debit purchase and original receipt from parts store. I also keep the box the pump came in and took a picture with receipt on-top next to MB label verifying part was OEM. For the statement of needed repair and steps taken, I just spelled out the facts and what I saw/found, and how it lead me to the pump replacement. After initially being denied, MB approved my reimbursement claim after I had the shop expand on the issues they found during diagnosis. It must say "fuel leak" somewhere on the invoice. The repairs were done in 2013 at an independent shop.